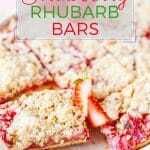 These Strawberry Rhubarb Bars are sturdy yet delicate. With soft cake-like layer at the bottom and a light oats crisp on the top. Sweet and sour. Summery and bright. Perfect dessert to celebrate summer and Canada Day! This post contains amazon affiliate links which means if you purchase something after following one of those links, I will receive a small commission. Rhubarb. Rhubarb. The word tags at my memories and pulls at some long-forgetten strings in the corner of my mind. Rhubarb. 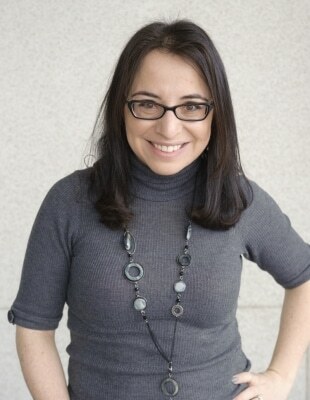 Barb. It sounds crisp and biting. Like a barb wire posed to knick your skin. Sour. Ready to bite the delicate tongue. Rhubarb. Rhubarb. Green and pinkish stalks. So long and elegant with their beautiful crinkly leaves. They remind me of thin ballerina dancers in pink leotards and tutus. Rhubarb. Something nostalgic. Sour stems dipped in white sugar grains. Funny enough, there are no real memories. I have never tried rhubarb in my childhood. I have never had it in my adolescence. Or maybe I did, yet I don’t remember. Strawberry and Rhubarb. Rhubarb and Strawberry. Such a classic combination that is so new to me and so delicious! I got introduced to a combination of Strawberries and Rhubarb just over 10 years ago. It was a pie, of course. I fell in love with the tang and bite of rhubarb in combination with the sweetness of the strawberries. Last weekend my father-in-law brought me some rhubarb stalks from his garden, so I knew I had to improvise and make something delicious and sweet and pink and beautiful. 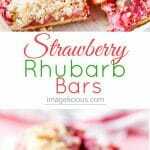 These Strawberry Rhubarb Bars are a combination of a few recipes. 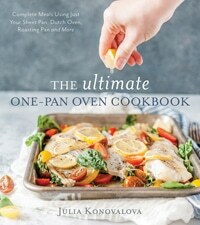 I used the dough from a recipe from my upcoming cookbook, The Ultimate One-Pan Oven Cookbook, that is coming out on August 28, so PRE-ORDER now. I added a delicious filling of sun-kissed strawberries and tart rhubarb from an old pie recipe that I used to make. And I topped it all with a light oats crisp for a nice crunch. The combination of the three layers is fantastic. 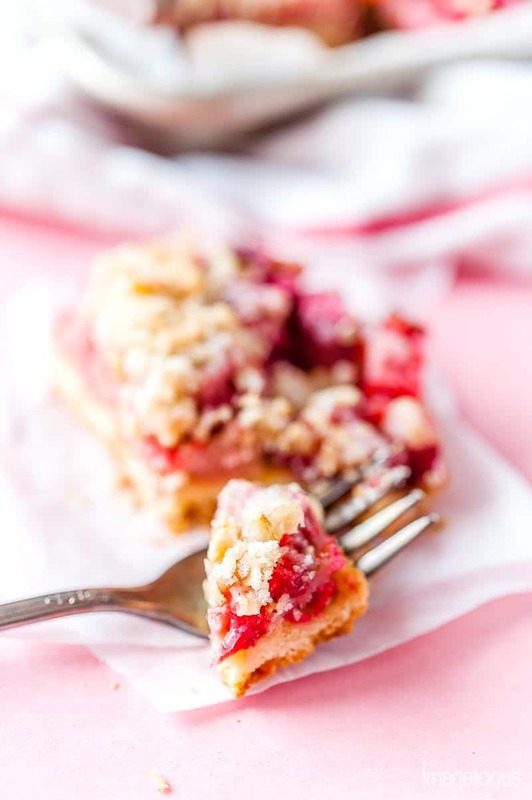 The bottom portion of the Strawberry Rhubarb Bars is a mix between a cookie and a cake. The fruit filling is almost like a custard. And the crisp provides a beautiful contrast to the pink centre. 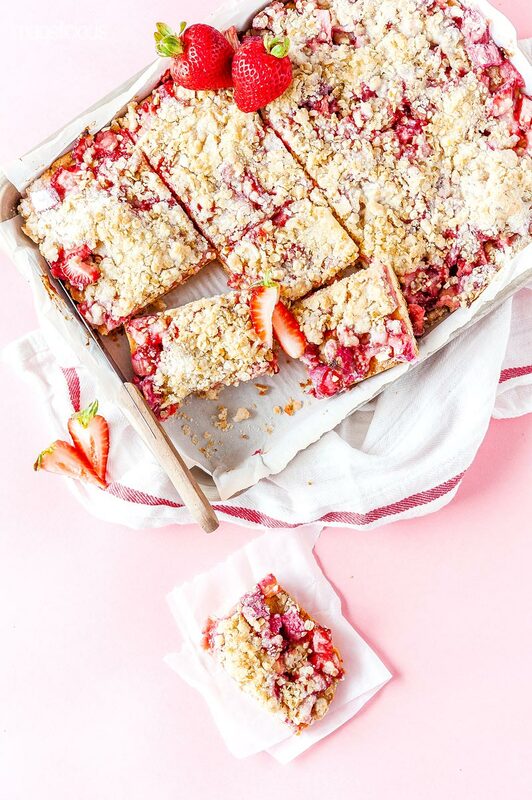 These Strawberry Rhubarb Bars are sturdy yet delicate. Soft and crisp. Sweet and sour. Summery and bright. Perfect dessert to celebrate summer! Is the Strawberry Rhubarb Dessert a cake? The bottom layer for the bars (I’m going to keep calling them bars) is almost like a cake. It’s not as sturdy as a cookie layer which is the most traditional for bars desserts. But since this Strawberry Rhubarb Dessert is actually cut into squares, I decided to go ahead and call it Bars. However, it’s almost a mix between a cake and cookie bars. 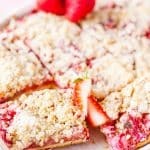 Why use ricotta for the base layer of the Strawberry Rhubarb Bars? 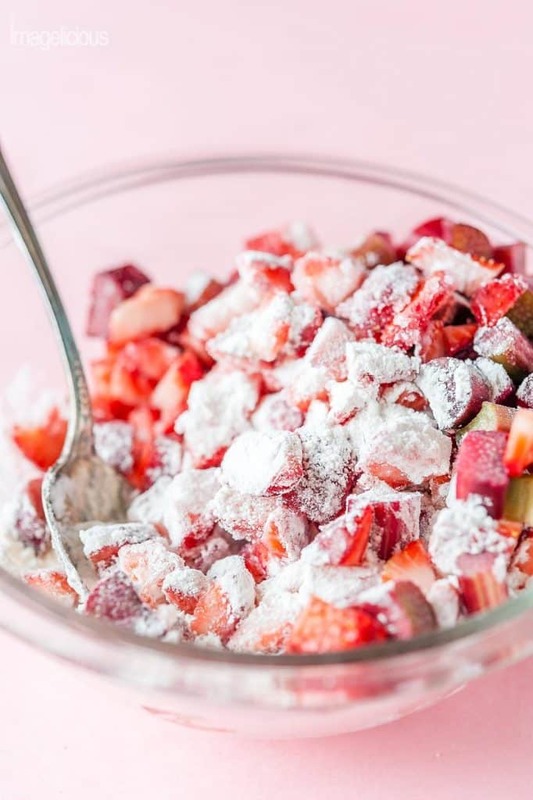 Ricotta is what actually makes the dough for this Strawberry Rhubarb Dessert more like a cake and less like a cookie layer. Ricotta adds that extra fluffiness that you’d expect in a cake. Using ricotta in the dough means that it’s a tiny bit healthier than using all butter in the pastry. If you want to make it into a Russian-style dessert, then use Farmers Cheese instead of Ricotta. 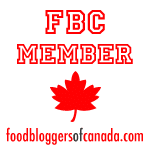 I use farmers cheese for the dough in my Apple Meringue Tart and it’s delicious! TIP: If you’d like to make the dough a bit more healthy, increase the amount of Ricotta and reduce the amount of butter by the same amount. Half butter and half ricotta would work fine. 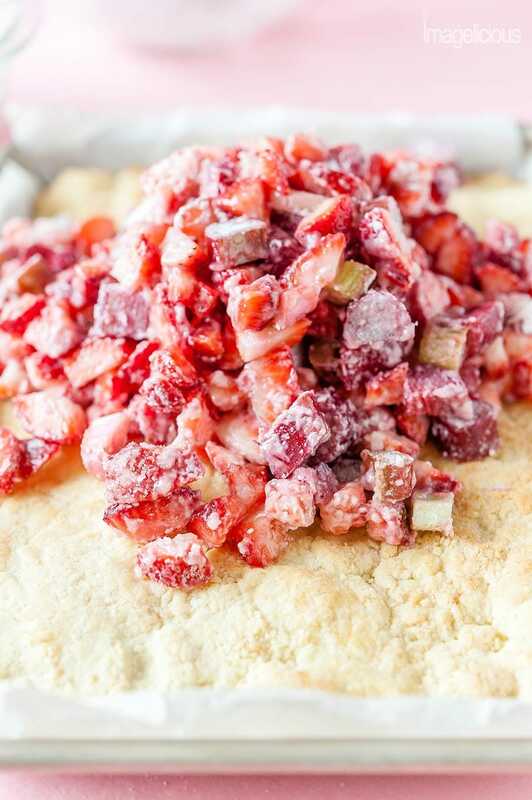 Do you need to use sugar and flour in the filling for this Strawberry Rhubarb Dessert? Flour in the strawberry and rhubarb filling makes it almost like a custard. The juices from the fruit with the flour create a very creamy filling. Technically, you could omit the flour but the filling won’t be as smooth and luscious. I am all for reducing the sugar wherever possible but you do need it here. 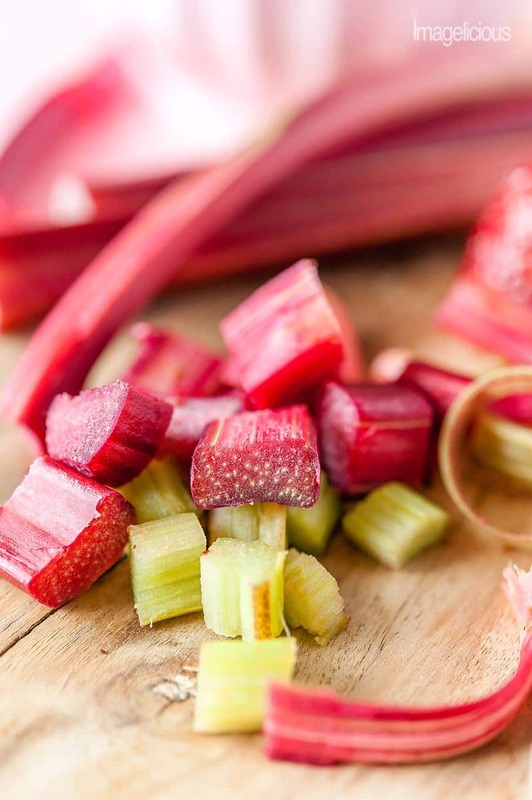 Rhubarb is notoriously sour and it needs an extra sweetener to make it palatable. If you prefer desserts that are more tart, you could reduce the amount of sugar in the fruit mixture. 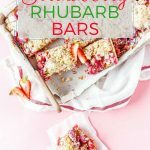 The recipe for these Strawberry Rhubarb Bars is much more involved than my usual one-bowl desserts. However, it is still quite easy and it does not take longer than some of my other sweets. Fruit filling and the crisp are prepared while the cake layer is baking, so there’s no extra prep time involved. The bottom layer is very simple. You can use a spatula to mix it or a hand mixer, which I prefer. Cream together the butter, ricotta, sugar, and an egg. Add the flour and it’s done. Spread the dough onto a parchment-lined sheet pan and pre-bake. 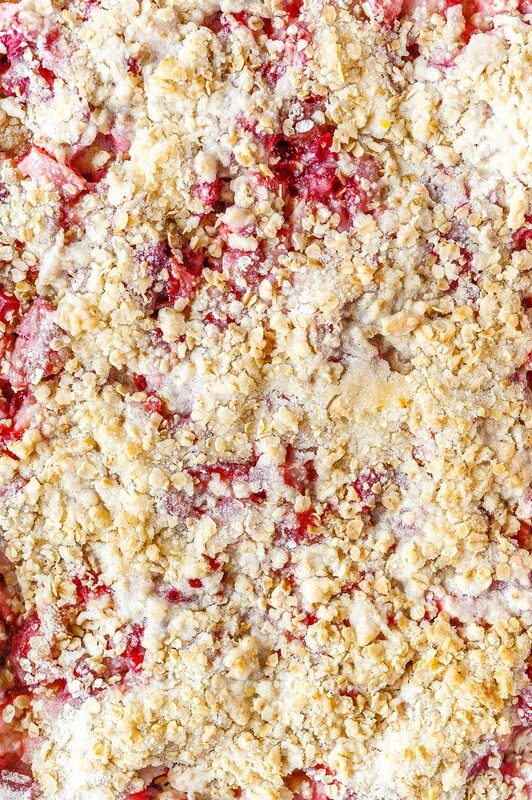 While the cake is pre-baking, cut up the rhubarb and the strawberries. Mix in the flour and sugar and set aside. TIP: To make the crisp, feel free to use the same bowl that you used for the dough, so that there’s less cleanup. 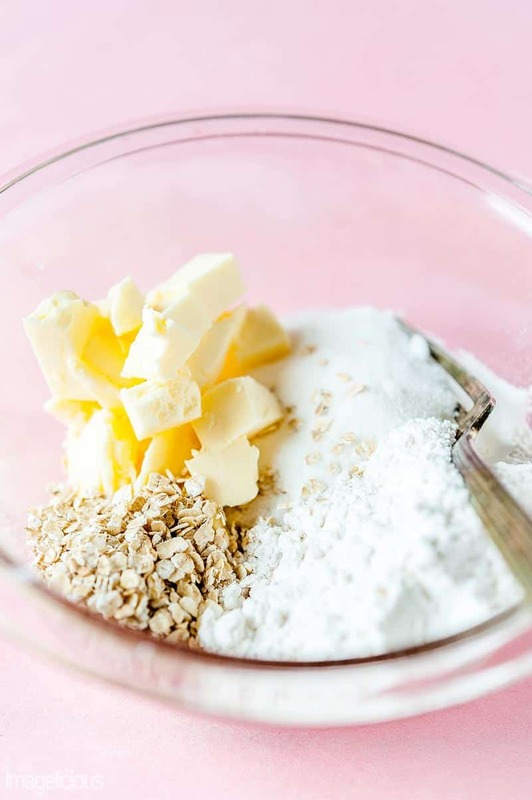 Mix together the oats, flour, a bit extra sugar, and cold butter until the mixture resembles coarse sand or small gravel. You could use a pastry knife, but the amount of the crisp is so small that I usually use just a fork. Once the dough got pre-baked a bit, add the Strawberry Rhubarb Filling, top it with the crisp and bake until all golden and bubbly. 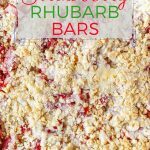 You will know that the Strawberry Rhubarb Bars are done as the smell will be intoxicatingly delicious! The bars are better after they cooled and settled for a few hours. Right after baking, the bottom part is a bit too cookie-like for my taste. Few hours later, it mellows down and becomes wonderfully fluffy and soft. The bars can be stored in a loosely covered container for two days on the counter. Or in an airtight container for up to a week in the fridge but storing them in the fridge will mean that the topping will not be as crisp. Line a 9x13 inch sheet pan (quarter sheet pan) with parchment paper. 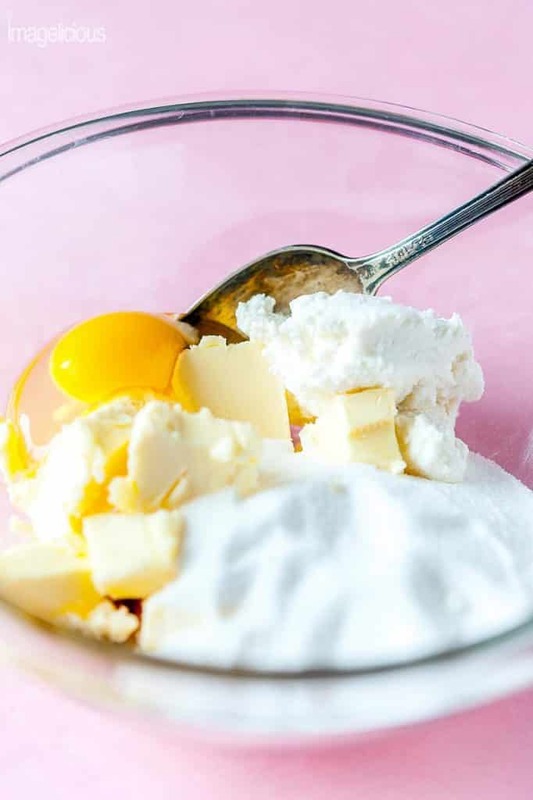 In a large bowl, combine the room temperature butter, ricotta, egg, sugar, and vanilla extract. Mix well together until smooth and creamy. Use a spatula or a mixer. Add the flour, baking powder, and salt. Mix in until all the flour is well incorporated. I find it's easier to do that using a spatula at this point but feel free to use a mixer if you'd like. Using your hands or a spoon, spread the dough onto the prepared sheet pan. Making sure that it's spread evenly and covers the whole sheet pan. Cut the strawberries into 1/4 inch (1 cm) pieces. No need to be really precise. Cut the rhubarb into 1/4 inch (1 cm) pieces. 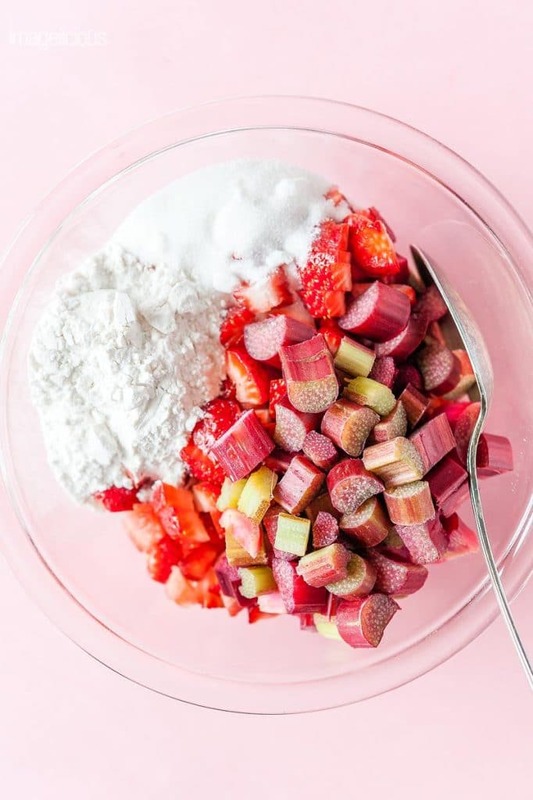 In a medium bowl, combine the cutup strawberries, rhubarb, flour, and sugar. 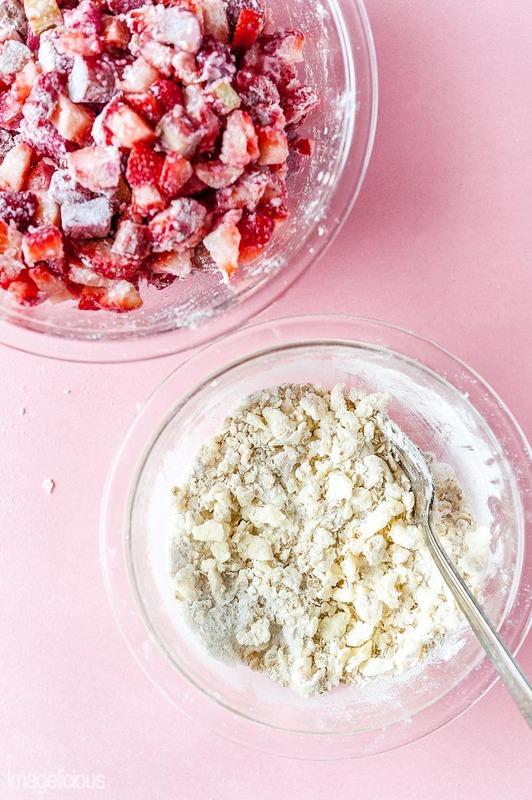 Mix well until the flour and sugar cover the fruit. In a separate bowl, combine all the ingredients for the crisp topping layer. Using a patry knife or a fork, mix in the butter into the dry ingredients until the mixture resembles very coarse sand or fine gravel. After the bottom layer for the bars has been baked for 20 minutes, take the sheet pan out of the oven. Spread the Strawberry Rhubarb filling all over the dough. Sprinkle the crisp topping over the fruit filling as evenly as possible. Return back to the oven for another 35 minutes. Once baked, cool and cut into 16 bars. Flour... Flour... I know that all the calculators (including the one in this recipe plugin) say that 1.5 cups of flour weigh about 180g but my flour always weighs more, almost twice as much. I always scoop the flour right out of container with a measuring cup and lightly tap it on the side to get rid off the top overflow. 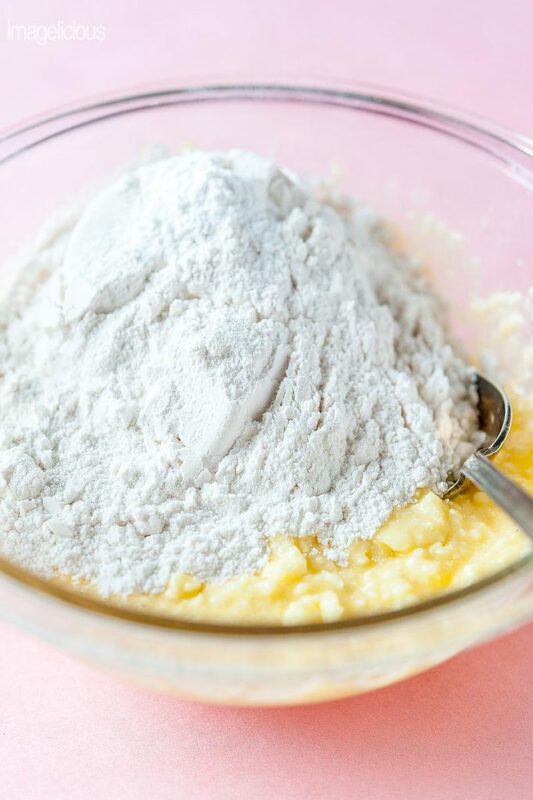 If you use flour by weight, make sure to see the photos for the texture that you need to expect for the dough. You might need to use more flour if only weight measurements are used. My first taste of rhubarb was also in a pie — and I’ve been smitten ever since. Unfortunately the season is short — and in South Florida, where I’m from, it’s even shorter. In fact, I never even saw fresh rhubarb in our markets this season. Doh! I’m pinning this though — because these bars will happen next spring! I love a good fruit crumble bar! What an interesting addition with the ricotta in the base for a more cake-like texture. I’ll have to try that! Bars like these are always so great for summer parties, when you need a dessert that’s easy to serve and portable. 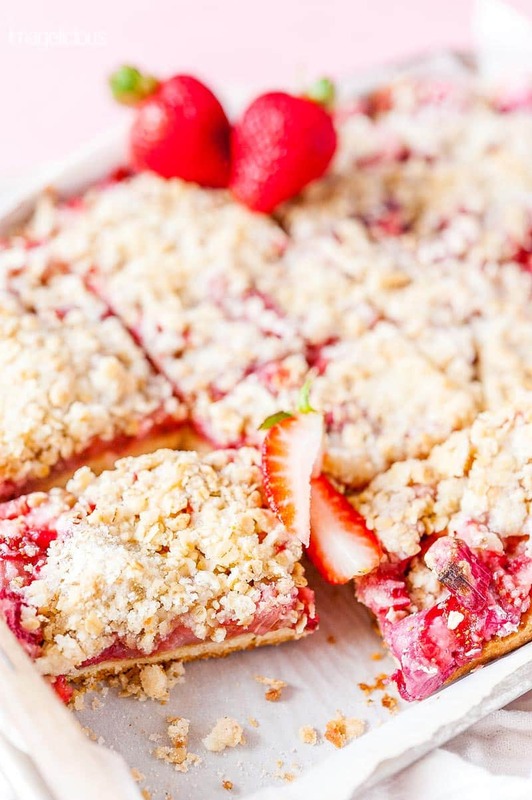 Such a great way to serve that classic strawberry-rhubarb combo! I need these in my life! Crumbles are basically my favorite type of dessert, and I don’t get to eat hem nearly enough. 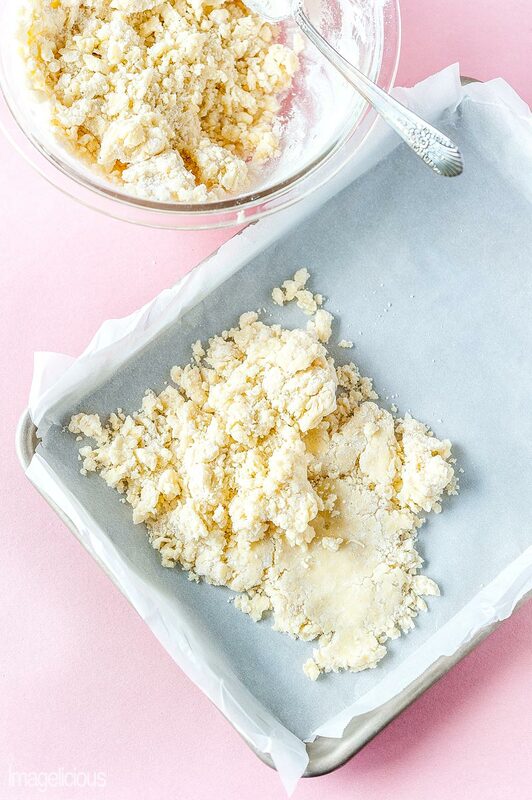 I love how easy these are and the fact that I basically get the essence of a deliciously messy crumble in a neat and clean bar. I’m going to give these a shot! (And likely eat the entire tray by myself). Ricotta is a great idea. I love strawberry and rhubarb together. These bars looks so fun and tasty, I know my entire family will love them. They are perfect for 4th of July too. Thank you for this recipe. I love the sound of these bars… the ricotta is an inspired twist and I am just imagining how amazing it would taste here in these bars. 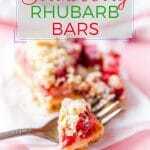 Rhubarb is one of my favorites and I have a rhubarb plant I’ve kept for years so I know what I’m making soon! Strawberry rhubarb is a classic. I love the idea of making these into bars. They look so pretty with that bright red next to the crumbly top. So smart to use ricotta in the dough, I have never seen that before. Definitely saving this, our rhubarb bolted quickly this year, maybe I can find some in the grocery store. Thanks for sharing this! I love the use of ricotta in these bars! Plus, I’ve never had strawberry rhubarb in anything other than a pie. This sounds wonderful! 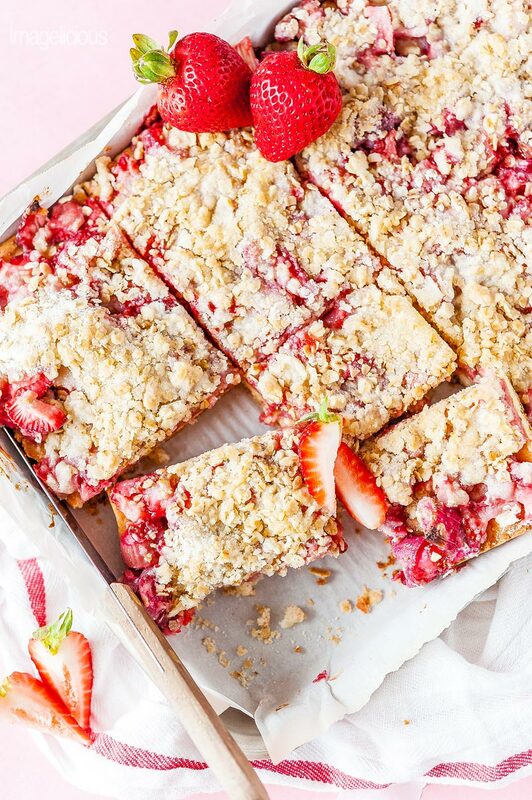 This bars looks so yummy and delicious.I was searching for one hour how i make easy and quick recipe with strawberry like this for our dessert tonight, boys are coming over for football match. I think their gonna love it.Thanks for the lovely recipe. These bars look amazing! I love the idea of adding ricotta to the base dough – why didn’t I think of that? I bet it makes for a wonderful, rich cake like base. Sounds so delicious and perfect. Definitely need to try this recipe soon. 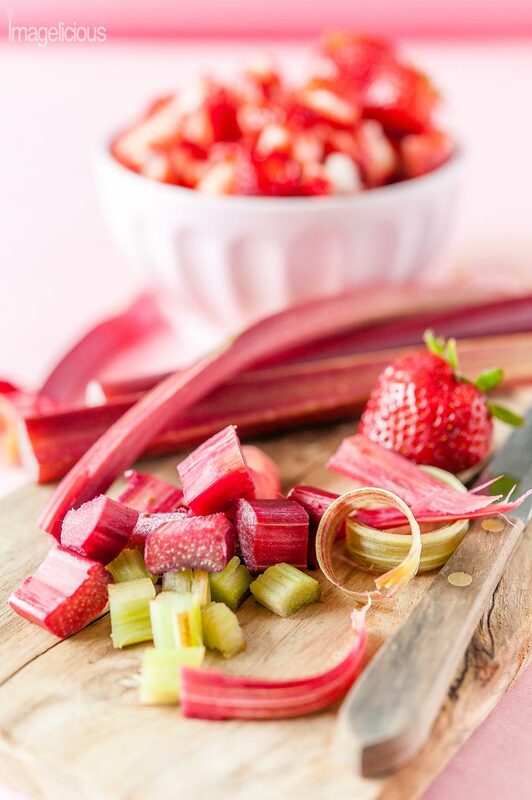 Yes the classic Strawberry Rhubarb combination never goes out of style. I used to pick rhubarb in my baba’s garden and eat it RAW dipped in sugar. When I think about it my mouth puckers and my face tightens up LOL!! This does look like the perfect dessert for CANADA DAY!! Stay cool….it is going to be a scorcher! !